Carmen Suite by National Ballet of Ukraine. Music by Georges Bizet and Rodion Shchedrin. Choreography by Alberto Alonso. Shot on 10.05.2014 at Jõhvi Ballet Festival. Yulia Kulik (Juliya Kulyk) as Carmen, Oleksandr Shapoval as Don Jose, Sergey Krivokon as Escamillo, Dmitry Chebotar as Zuniga, Raisa Betancourt as Fate, Yekaterina Tarasova and Varvara Milkuvich as cigarette factory girls. Yulia Kulik os soloist with National Opera of Ukraine. In 1999 she graduated from the School of Choreography by Vadim Pisarev (Donetsk Opera and Ballet Theatre Choreographic School), Donetsk, Ukraine and was accepted into a ballet company, Donetsk National Academic Opera and Ballet. Since 2013 – soloist of the National Opera of Ukraine Taras Shevchenko. 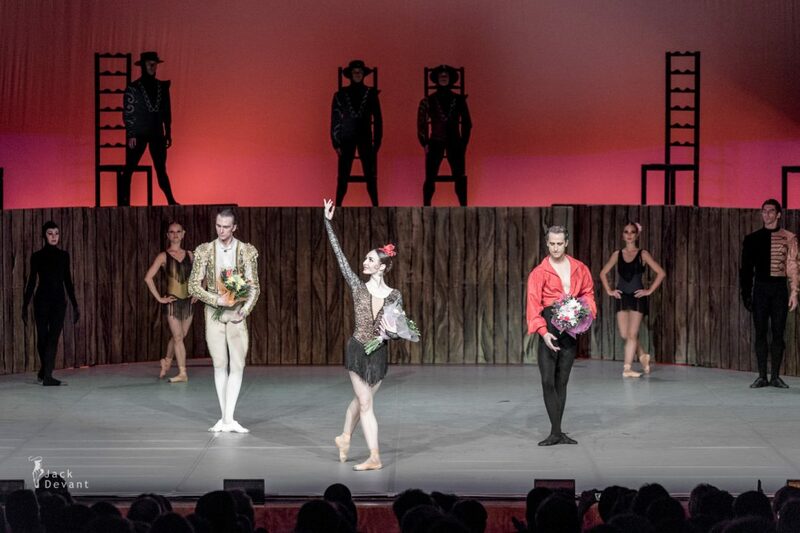 One Response to "Carmen Suite by Yulia Kulik, National Ballet of Ukraine"